Air cargo volumes at the world’s 20 busiest airports grew 6.8% in 2017, with Hong Kong again the number one freight hub at more than 5m tonnes, a 9.4% year-on-year increase. Airports Council International (ACI) reported that the top 20 cargo hubs handled a combined 51m tonnes last year, representing 43% of global airfreight volumes, but warned of the spectre of uncertainty from "protectionist sentiments". The trade association of the world’s airports said that passenger traffic at the world’s 20 busiest airports grew by 5.2% in 2017 at almost 1.5bn, representing 17% of global passenger traffic. Below Hong Kong for non-integrator hub volumes were Shanghai (PVG), Chicago (ORD) and Doha (DOH) all experiencing double digit growth of 11.2%, 12.6% and 15.0% respectively, said ACI. The association added that the rise in cargo volume growth reflected a global trend of “strengthening trade, e-commerce, and the reliability factor”. Added a spokesperson for ACI: “Air cargo experienced a revival across many of the world’s airports in 2017 and into 2018. Even with the uncertainty regarding the threat of trade wars and the growth of protectionist sentiments across the world, business confidence has remained strong through inventory build-ups and increased export orders in 2017. ACI continued: “Key air cargo centres, such as Chicago – O’Hare (ORD), experienced growth of 12.6% for 2017. “The airport, which has significantly expanded its air cargo facilities, is centrally located geographically serving regional manufacturing within an intermodal transport network. “The airport has also benefitted from international trade with China and other Asian countries. ORD’s international freight volumes increased by 12.2% in 2017." 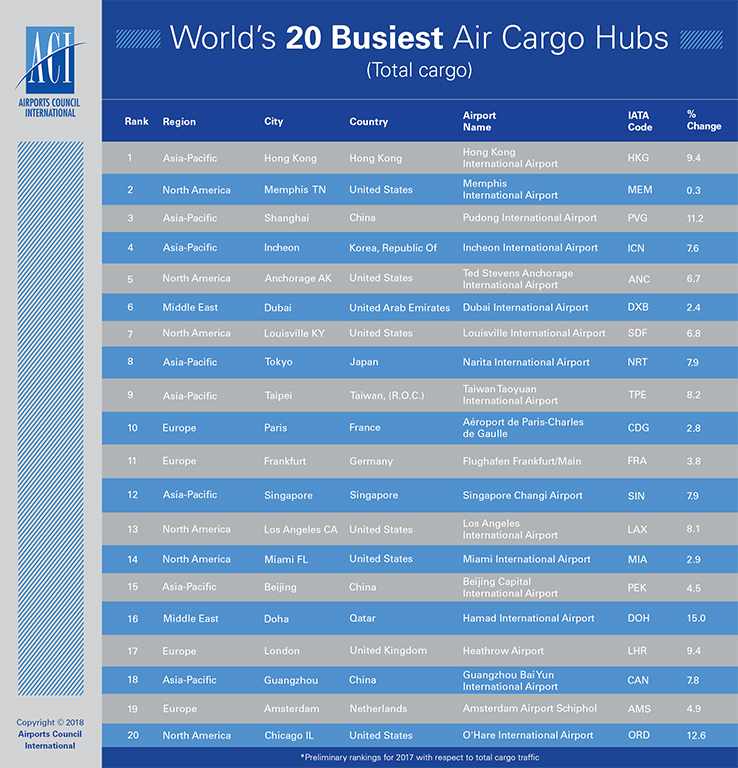 Angela Gittens, director general at ACI World, said: "The surge in cargo volumes and passenger numbers across many of the world’s airports is testament to heightened business and consumer confidence, at least in the short term. "The world’s airports continue to be a vital link in the economic multiplier effect that aviation provides and the role it plays as an enabler for global commerce is growing." "The universal access to online retail and e-commerce platforms represents a competitive pressure to the traditional brick and mortar retail shops in certain markets but the huge growth in e-commerce has fuelled the air cargo side of the airport business. This has resulted in increased global activity, especially in major markets such as China and the US." Gittens continued: "The spectre of uncertainty regarding trade policy among major economies comes at a time when global commerce and our industry has recently thrived. The transpacific link, for instance, is an important ingredient in boosting international passenger traffic and international freight volumes".